Charlie Hebdo and the Jewish supermarket in Paris, the cafe in Sidney, the shopping mall in Nairobi, the movie theater in Aurora, the summer camp on the island of Utøya, the hotel in Mumbai and lots of schools and other public places all over the world are known as “soft targets” – where citizens work, study or relax. The opposite – “hard targets” – are places with intense security like the Pentagon and World Trade Center and meanwhile also airports. Scott Stewart, the vice president of tactical analysis at the global intelligence and advisory firm Stratfor, told VICE News that the shift from hard targets to soft targets escalated in 2004 with al Qaeda. There is also a movement away from bombings and toward armed assault. But terrorism is not the only threat. We know of multiple shootings in public by mentally ill people or religious fanatics, by former employees, bullied students or jealous (ex) partners. The United States experienced a lot of these public shootings. 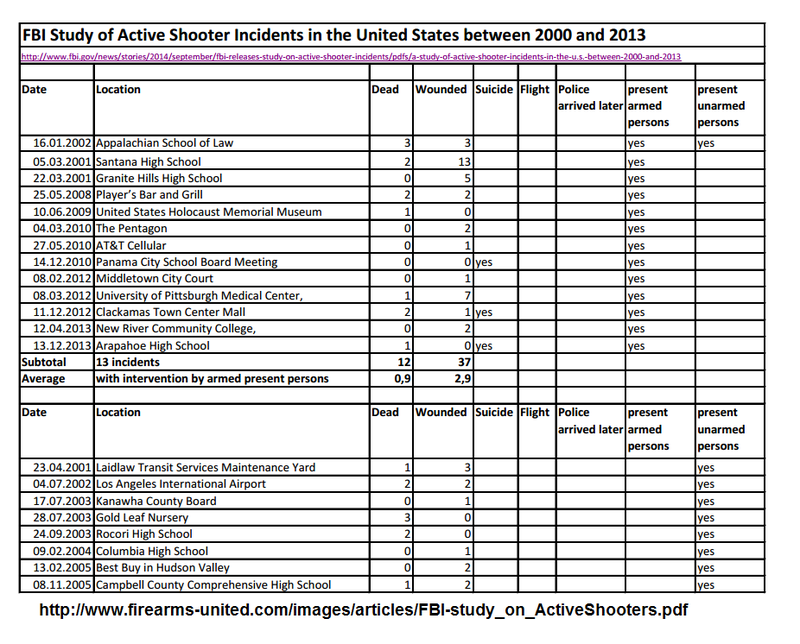 Therefore the FBI initiated in 2014 a study of “active shooter” incidents. The goal of the FBI study is to provide data so local law enforcement can better understand how to prevent, prepare for, respond to, and recover from these incidents. They concentrated on the active aspect which implies that both law enforcement personnel and citizens have the potential to affect the outcome of the event based upon their responses. This study helps clarify the environment with regard to both the level of risk citizens face and the speed with which active shooter incidents occur. A majority of the incidents [..] ended on the shooter’s initiative before the police arrived—sometimes when the shooter committed suicide or stopped shooting, and other times when the shooter fled the scene. In 64 incidents where the duration of the incident could be ascertained, 44 (69.0%) of 64 incidents ended in 5 minutes or less, with 23 ending in 2 minutes or less. The study identified 21 (13.1%) of 160 incidents where unarmed citizens made the selfless and deeply personal choices to face the danger of an active shooter. In those instances, the citizens safely and successfully disrupted the shootings. [..] And in 6 other incidents, armed off-duty police officers, citizens, and security guards risked their lives to successfully end the threat. These actions likely saved the lives of students and others present. Recognizing the increased active shooter threat and the swiftness with which active shooter incidents unfold, these study results support the importance of training and exercises—not only for law enforcement but also for citizens. It is important, too, that training and exercises include not only an understanding of the threats faced but also the risks and options available in active shooter incidents. We must all act together to make it clear to our friends and enemies that Europe can guarantee the security of its citizens without compromising the values and identity. What is the EU focus on the protection against terrorist attacks? How is the movement of illegal firearms currently regulated in the EU? Military weapons cannot be traded to private persons. Under specific conditions only collectors can keep military weapons. [T]he Commission decide on how to proceed to amend the Firearms Directive, which could lead to a proposal for stricter checks for some categories of weapons and by prohibiting the most dangerous weapons, which are already subject today to mandatory authorisation. The EU thinks about more restrictions on weapons which were not used in the attacks and are owned by millions of citizens (alarm weapons and replicas ) or by law-abiding civilians (allready mandatory for licenses). 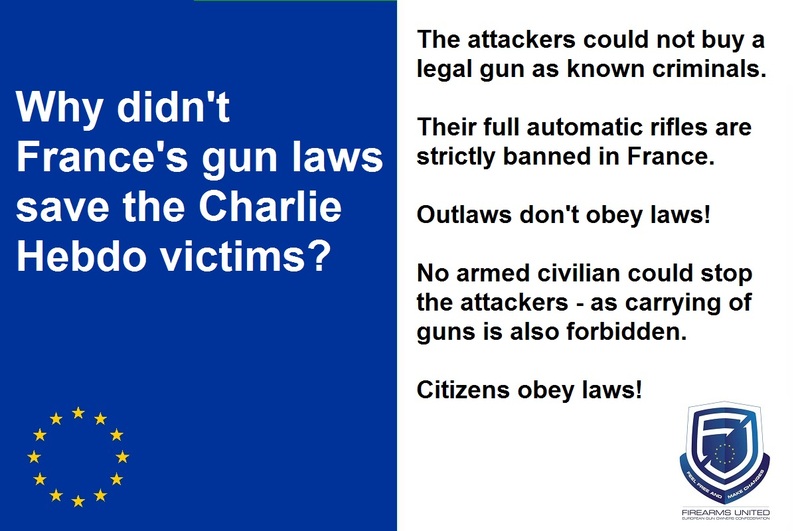 Even the EU knows that the used weapons were military weapons and already prohibited and our European gun law could not prevent the attacks. We citizens cannot judge the intelligence tools, but we know how state servants and how civilians respond to threats. Some are brave heroes, some are cowards. Usually lots of civilians are at the location and no armed police officer or security guards is present. Furthermore more and more police stations and police patrols are closed and stopped for financial reasons. A fast respond to an attack by police is hardly possible. Police cannot reach the location within 5 minutes. In some countries, as Great Britain or Germany, emergency calls are responded by answering machines, by call center workers or their line is busy. Marie-Helen Maras, a security professor at John Jay College of Criminal Justice, explained that if there were police or military officers posted in or near every soft target — including cafes or movie theaters — people would no longer go to them. They would be convinced they were in more danger with the officers there, and police need to ensure they are not creating more fear than is necessary. What law enforcement can do, Maras said, is ensure they can mitigate the effect of any lone wolf or group attack on a soft target by having quick response times and by providing training for all the private security personnel employed by malls, offices, and hotels. Either to create secure perimeters around the locations or allow civilians extended access to firearms of their own, so they would be able to defend themselves in case a terrorist act occurs. In the interview with ABC News, Noble was more blunt and directed his comments to his home country. “Ask yourself: If that was Denver, Col., if that was Texas, would those guys have been able to spend hours, days, shooting people randomly?” Noble said, referring to states with pro-gun traditions. “What I’m saying is it makes police around the world question their views on gun control. Abdul Yusuf Haji travelled to the mall with his handgun after receiving a text messages from his inside trapped brother. He saw three women with three children huddled under the table – in the middle of the crossfire. Together with other armed rescuers he helped rescue all six of them. After being shot by one of the attackers Satpal Singh rescued lots of people by pushing them onto the streets. He got help by an armed policeman who got shot in the leg and had to escape. When he asked other police officers to help him they refused. So he returned unarmed with other citizens and rescued more people, some with gunshot wounds. Three policemen had been honoured who spearheaded the first rescue mission, also the five soldiers who died during the attack. Before the attack in Nairobi Israelis issued warnings that buildings owned by its citizens could be attacked in September in Nairobi and Mombasa. Westgate is partly Israeli-owned. A 8,800-word dossier details terrorist plots and other activities by the militant group, including a direct warning of a terror plot in Nairobi between September 13 and 21. Security sources have told the BBC that the militants hired a shop there in the weeks leading up to the siege. This gave them access to service lifts at Westgate enabling them to stockpile weapons and ammunition. Having prepositioned weapons they were able to re-arm quickly and repel the security forces. The security expert Scott Stewart, mentioned in the beginning told VICE news that law enforcement has to prioritize its security resources. Government can’t allow something like a nuclear weapons storage facility or chlorine plant to be attacked. Law enforcement and security can’t protect everything. So they concentrate on protecting of hard targets and VIPs. After the attack of Charlie Hebdo dozens of VIPs asked for personal protection within 24 hours. But France has only 700 highly trained agents which are able to protect Very Important Persons. According to the calculation of the French administrative financial jurisdiction, the average budget of a police officer assigned to this type of contract would amount to 71,879 euros per year. And you need more than one personal bodyguard to protect one VIP. We know that Russia informed US agencies one of the Boston bombers may have trained assaulted attacks in a camp and was flying to the US. We know that the French attackers were suspects for the police, even the one of the Toulouse massaker. The attacker in Belgique should have appeared to court the next day. When we studied the incidents listed by the FBI study we noticed that some shooters had been sentenced because of violent behaviour, others had been treated for schizophrenia. Both are exclusion criterias for legal ownership. But some shooters were still legal gun owners. Even the mass shooters of Alphen (NL) and Cumbria (UK) had been reported to the police because of their mental illness and strange behaviour. The young men in Alphen got his rifle by a corrupt police officer. According to the TIME Magazine the full-scale surveillance of a single individual for a year costs more than 5 million Euro. The second problem with arrests: In prisons highly ideological jihadists meet a vulnerable clientele. This is especially true for young offenders institutions. Two of the three assassins of Paris have gone through the major phases of their Islamist radicalization in prison. The same goes for Mehdi Nemmouche that in the Jewish Museum in Brussels shot and killed four people in spring 2014. The path of Mohammed Merah led by French prisons before he killed seven people in 2012 in Toulouse and Montauban. We have a lot of laws and a lot of informations. Both cannot prevent all crimes. “People are afraid to come to synagogue. People are afraid to go to Jewish schools.” He said that ‘’the police are not doing enough. We just need more. The best solution is having at least two police officers at each Jewish institution, 24 hours a day. Until that happens we need to be able to feel secure in other ways.” The weapons would all be registered. “We will be under the supervision of authorities. It would be completely controlled in the most professional way,” he added. We agree with Rabbi Margolin, that carrying arms (with proper training and license) is the best protection. We remind Rabbi Margolin, that an unarmed muslim saved the life of more than a dozen jews in the supermarket. 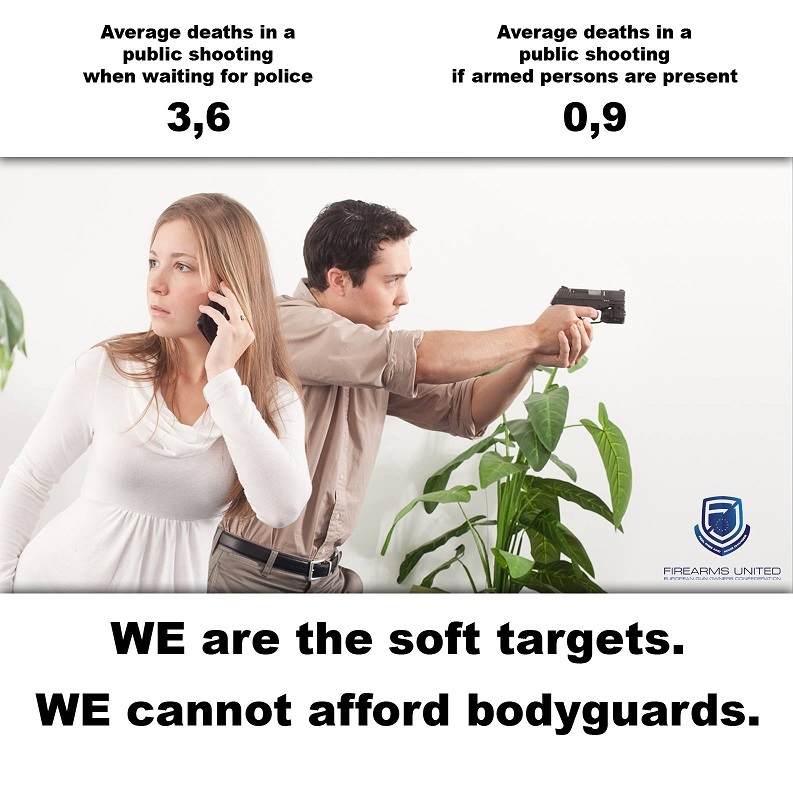 We all are soft targets. We all have to protect ourselves and our neighbours and bystanders. When we look to North Africa and Nigeria we see lots of ordinary people under attack by religious fanatics. And we also see ill-equipped or unwilling soldiers who are not able to protect their people. In the same week of the attack in Paris, where 17 people had been killed, another 2000 people had been killed in Nigeria. Nigeria came in spring 2014 in the news when more than 200 girls had been kidnapped by Boko Haram. Give Your People Guns To Defend Themselves! Within the last three days, over 600 of the citizens of your state were slaughtered cheaply. They died at work, at the market, while bathing their children, in the farm. This is just one more week of death in your state. Your state is in global news because 234 girls were kidnapped in your state; these we know add to the hundreds who have been kidnapped, and abused till pregnancy or death by Boko Haram over the past four years. These girls, we know add to the more who have been kidnapped after April 15th and the boys of your state, and farmers of tomorrow who have likewise been kidnapped and forced at knife-point to become Boko Haram’s new recruits all through the four years. Dear Governor Kashim Shettima, do you know that what has happened in Borno would never happen in any other state in Nigeria without the governor giving his people guns and a course in training so they can defend themselves? Your people are great warriors and Patriots. Let them defend themselves. But civilian villagers have to defend themselves with mere rocks, bows and arrows, hunting shotguns, swords and “charms”. Yemen, the country with the most private gun owners after the US, is unstable because of groups who fight each other for gaining power. But you won’t hear that whole villages are slaughtered. According to scientists the armed tribes of the country don’t follow any ideology but rather short-term interests (security, money, access to resources,etc.). The wide proliferation of small arms and light weapons in the (North) Yemen produces a political balance and prevented autocracy. In the past the Yemenis always increased support to the oppositional actor. We want to remind the lawmakers and people in power, that their point of view towards their own people is not always neutral and realistic, but often manipulated by apocalyptic horror movies and influenced by security officers and their own personal attitude. From the beginning of the field in the 1950s to the present, the major sociologists of disaster—Charles Fritz, Enrico Quarantelli, Kathleen Tierney, and Lee Clarke—proceeding in the most cautious, methodical, and clearly attempting-to-be-politically-neutral way of social scientists, arrived via their research to an enormous confidence in human nature and deep critique of institutional authority. Caron Chess and Lee Clarke of Rutgers named the reaction of the people in power in times of crisis “elite panic”. Elites tend to sabotage grassroots efforts, e.g. self defense, because they fear to appear incompetent – and some will also project their own selfish and unscrupulous behavior towards mankind to the ordinary people who act – different to the rich and powerful – charitable and unselfish. During the evacuation of the World Trade Center a young man told his story: “ I was evacuating with my coworkers; this sort of cloud of death was approaching. I’m an ex-college athlete, I could run faster than all of them, but I slowed down.” To slow down as death is approaching is completely contrary to who we think we are in an emergency. Most of us believe in the “you’ll trample me to save yourself, you’ll push me out of the lifeboat” premise. We look now to the 34 active shooting incidents which the FBI listed as stopped by resistance of armed and unarmed off-duty officers, security guards and normal civilians. On January 16, 2002, at 1:15 p.m., the shooter, 43, armed with a handgun, began shooting in the Appalachian School of Law located in Grundy, Virginia. Three people were killed; three were wounded. When the shooter left the building where the shooting took place, he was approached by two students with personal firearms and one unarmed student. On March 5, 2001, at 9:20 a.m., the shooter, 15, armed with a handgun, began shooting in Santana High School in Santee, California. Two people were killed; 13 were wounded. The shooter was apprehended by an off-duty officer who heard gunshots. The shooters spoke on two occasions of his plan to “pull a Columbine” at Santana High School, but no reports were ever made of these threats to the school. He took his father’s Arminius .22 caliber long-action revolver from the locked gun cabinet in their apartment. On May 25, 2008, at 2:25 a.m.,the shooter, 30, armed with a handgun, began firing inside Player’s Bar and Grill in Winnemucca, Nevada. Two people were killed; two were wounded. The shooter was killed by a citizen with a valid firearm permit before police arrived. When the shooter was reloading his semi-automatic gun, a man from Reno took out his gun and shot him. On March 4, 2010, at 6:36 p.m., the shooter, 36, armed with a handgun, began shooting at Pentagon police officers as he approached the entrance to the security screening area at the Pentagon in Arlington, Virginia. No one was killed; two federal law enforcement officers were wounded. The shooter wounded two Pentagon police officers at a security checkpoint in the Pentagon station of the Washington Metro rapid transit system. The officers returned fire, striking him in the head. On May 27, 2010 at 1:00 p.m., the shooter, 79, armed with a handgun, began shooting in an AT&T Wireless Store in New York Mills, New York. He had recently been reported to the police by AT&T for harassing and threatening employees. No one was killed; one person was wounded. The shooter was killed by an off-duty police officer who was a customer in the store. The shooter entered the store with a .357 magnum in his hand, and a list containing the names of six employees he intended to shoot. The senior citizen shot at the first AT&T worker, Seth Turk, but was gunned down by an off-duty police officer. On December 14, 2010, at 2:14 p.m., the shooter, 56, armed with a handgun, began shooting during a school board meeting in the Nelson Administrative Building in Panama City, Florida. The shooter’s wife had previously been employed by the school district. After allowing several people to leave the room, the shooter fired in the direction of board members. No one was killed or wounded. The shooter committed suicide during an exchange of gunfire with the school district’s armed security. Despite four or five shots being fired from shooter’s gun, no board members were hit. He was shot again by Jones, the school’s police officer, fell to the ground, blindly fired a few more shots at Jones, then put the gun to his head and committed suicide. On December 11, 2012, at 3:25 p.m., the shooer, 22, armed with a rifle, began shooting at people waiting to see Santa Claus in the Clackamas Town Center Mall in Happy Valley, Oregon. Two people were killed; one was wounded. The shooter committed suicide before police arrived. The shooter fired a total of seventeen shots, killing two people and seriously wounding a third person before being confronted by Nick Meli, a legally armed civilian. After being confronted by Meli, the shooter retreated behind a column and committed suicide. On December 13, 2013, at 12:30 p.m., the shooter, 18, armed with a shotgun, machete, and three Molotov cocktails, began shooting in the hallways of Arapahoe High School in Centennial, Colorado. As he moved through the school and into the library, he fired one additional round and lit a Molotov cocktail, throwing it into a bookcase and causing minor damage. One person was killed; no one was wounded. An armed school resource officer, Deputy James Englert of the Arapahoe County Sheriff’s Office, was on regular duty in the school at the time of the shooting, heard the shots, and ran towards the sounds. According to Sheriff Grayson Robinson, Pierson realized this, which was a “critical element to the shooter’s decision” to commit suicide. 13 incidents had been stopped by present and armed police officers, security guards, off-duty officers and civilians with personal firearms. 12 persons were killed; 37 were wounded. On April 23, 2001 at 6:00 a.m., the female shooter, 36, armed with a handgun, began shooting in the Laidlaw Transit Services maintenance yard in San Jose, California. One person was killed; three were wounded. The shooter was restrained by a co-worker until police arrived and took her into custody. Police hailed bus driver Gregory Alan Lee, 37, for seizing the shooter minutes after the shooting began when she dropped her empty weapon on the ground. She still had bullets in her pockets, police said. On February 9, 2004, at 10:30 a.m., the shooter, 16, armed with a shotgun, began shooting while entering Columbia High School in East Greenbush, New York. No one was killed; one person was wounded. The shooter was restrained by administrators before police arrived and took him into custody. The teachers reached the shooter as the gun recoiled and the two fell to the ground and one wrested the gun from the shooter. On September 29, 2006, at 8:00 a.m.,the shooter, 15, armed with a handgun and a rifle, began shooting in Weston High School in Cazenovia, Wisconsin. One person was killed; no one was wounded. The shot victim was the principal John Alfred Klang who grabbed the handgun. The school custodian, Dave Thompson, wrestled the shotgun away from the shooter. Principal Klang then entered the hallway and confronted the shooter, who was still armed with the handgun. The shooter grabbed the revolver from inside his jacket and fired several shots. Klang grabbed him, wrestled him to the ground and swept away the gun. On October 9, 2006, at 7:40 a.m., the shooter, 13, armed with a rifle and a handgun, began shooting in Memorial Middle School in Joplin, Missouri. Fascinated by the Columbine bloodbath, a 13-year-old boy in a dark green trenchcoat and mask carried an assault rifle into his school, pointed it at students and fired a shot into a ceiling before the weapon jammed, authorities said. Hearing the shot, the school principal located the shooter, escorted him from the building, and turned him over to police. No one was killed or wounded. On February 23, 2010, at 3:10 p.m., the shooter, 32, armed with a rifle, began shooting in Deer Creek Middle School in Littleton, Colorado. No one was killed; two people were wounded. The shooter was restrained by teachers until police arrived and took him into custody. Teacher David Benke, a 6-foot-5 inch former college basketball player who oversees the school’s track team, tackled the suspect as he was trying to reload his weapon. “He was trying to rack another round. He couldn’t get another round in before I got to him so I grabbed him,” Benke said, recalling that he didn’t have time to fear for his life. On January 8, 2011, at 10:10 a.m., the shooter, 22, armed with a handgun, began shooting during a congressional town hall meeting sponsored by U.S. Representative Gabrielle Giffords outside a Safeway store in Tucson, Arizona. Six people were killed; 13 were wounded, including Rep. Giffords. The shooter was restrained by citizens before police arrived and took him into custody. The shooter stopped to reload, but dropped the loaded magazine from his pocket to the sidewalk, from where bystander Patricia Maisch grabbed it. Another bystander clubbed the back of the assailant’s head with a folding chair, injuring his elbow in the process, representing the 14th injury. The shooter was tackled to the ground by 74-year-old retired United States Army Colonel Bill Badger, who had been shot himself, and was further subdued by Maisch and bystanders Roger Sulzgeber and Joseph Zamudio. Zamudio was a CCW holder and had a weapon on his person, but arrived after the shooting had stopped and did not draw his firearm. On January 10, 2013, at 8:59 a.m., the shooter, 16, armed with a shotgun, allegedly began shooting in a science class at Taft Union High School in Taft, California. No one was killed; two people were wounded. An administrator persuaded the shooter to put the gun down before police arrived and took him into custody. Teacher Ryan Heber and campus supervisor Kim Lee Fields both helped evacuate the students out of the room and persuaded the gunman to drop his weapon and surrender. 21 incidents had been stopped by unarmed civilians and unarmed guards. 25 persons were killed; 47 were wounded. The average of wounded people are similar.